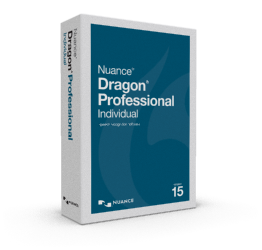 The all-new Dragon Professional Individual, v15, a smarter next-generation speech recognition solution empowers busy professionals to complete documentation and reporting quickly and accurately on the PC, so you spend less time on paperwork and more time on activities that boost the bottom line. Leveraging the latest in Deep Learning technology, Dragon constantly learns and adapts to your unique voice and environmental variations—even while you’re dictating—to deliver new levels of personalized accuracy and productivity. Robust transcription, powerful customization, and the ability to seamlessly sync with the Dragon Anywhere mobile dictation solution extend the benefits of speech recognition to meet your unique business needs wherever your job takes you. Dragon Professional Individual, v15 expands the possibilities of speech recognition innovation with a next-generation speech engine. Dragon uniquely brings consistent, optimal accuracy to the PC with Deep Learning technology and adaptation techniques that continuously adjust to your voice or environmental variations even while you’re dictating. With new engine, get optimal accuracy for speakers with accents or in slight noisy environments such as in a cubicle environment. With Dragon Professional Individual, it’s quick and easy to create custom voice commands. This feature lets you insert a standard reply, a signature block, a logo, a form template or other boilerplate content by speaking a simple command for significant time savings. You can also accurately transcribe another single speaker’s voice from pre-recorded audio ﬁles or from podcasts. No additional training is also needed to transcribe third-party speakers, so you can complete transcription quickly and accurately. Dragon Anywhere is a separate, cloud-based solution that provides continuous dictation capabilities, letting you create and edit documents of any length by voice directly on your iOS or Android device. It adapts to your voice and terminology so you can dictate, edit, navigate and format quickly and accurately within your document-- using your own customized words, shortcuts and commands—from anywhere, at any time. You can share documents and sync custom words and commands with Dragon Professional Individual for seamless productivity wherever your job takes you. Gain immediate access to your dictation so can spend less time behind a desk completing administrative tasks and more time contributing to your bottom line. With automatic microphone detection, Dragon Professional Individual will conveniently show you which microphones are available for you to use. Because Dragon lets you use multiple audio device types within the same profile, you can easily switch to another microphone while keeping all your personalized preferences for accuracy and formatting. This feature is useful if, for example, you use a USB mic at home, a wireless mic at work and your laptop’s built-in mic when you’re on the go. Any other Nuance-approved microphone: See support.nuance.com/compatibility for more information. Optimal accuracy achieved for speakers with accents or in slightly noisy environments such as in a cubicle. Faster startup time with synchronization of shared words and auto-texts from Dragon Anywhere performed in the background; there is no need to log in and out for synchronization to occur. *Transcription of third-party speakers may require an additional license for each unique speaker.